Last Saturday night, Studio 24 was in full swing. The cottage-like nightclub and venue on Calton Road in Edinburgh was having one of its final flings before it closes its doors forever next month. This follows the club’s sale to developers by the family who have owned the club for a quarter of a century. This came about following what Studio 24 say was a series of complaints from neighbours regarding noise from the club and apparent threats to their licence from City of Edinburgh Council officials. CEC say no complaints have been received since November 2016. Studio 24 say otherwise. On Saturday in the main room downstairs, a night called Keep it Steel was hosting a ‘Heavy Metal Prom Night’. Upstairs, in the venue’s smaller room, Betamax played a mix of post-punk and new wave classics. Among a cross-generational spread of dancers, award-winning contemporary dance artist and choreographer Jack Webb was there at Betamax, as he frequently is, busting some moves inbetween asking for Into The Garden, a piece of post-punk poetry by early 1980s John Peel favourites, Artery. Passers-by walking the length of Calton Road on Saturday night are unlikely to have been aware of any of this. Sure, there will have been comings and goings from the venue, smokers chatting outside and, at the end of the night, a gaggle of tired but elated party people walking home. But for a city centre night club in a major European capital on a Saturday night, this is nothing unusual. Or you would think so, anyway, especially when the only sound on the street apart from a few passing cars and late-night voices when Waverley Station is still open is the amplified tannoy relaying the latest train times. For the last fifteen years, however, Studio 24 has been under siege. This has come first from developers desperate to swallow it up and transform the building into flats in keeping with those that have sprung up around it as part of a slow pincer movement of gentrification. During that period as well, Studio 24 has received a steady stream of complaints about noise emanating from the club. Some of those purchasing the new builds were informed by those selling that the flats were fully soundproofed. This apparently turned out not to be true, but by the time it came to light, the holding companies who stated otherwise had dissolved, and were no longer liable for the properties. This meant that, even though Studio 24 existed long before the flats, the owners of the club were seen to be in the wrong, and were forced to shell out thousands of pounds on sound-proofing on top of that already in place. Over the last two years, a City of Edinburgh Council short term working group called Music is Audible has been meeting to attempt to address some of the problems that exist in Edinburgh’s live music provision. Much of the discussion regarding a perceived lack of civic will to support live music in the city stemmed from the existence of a licensing clause that stated that all amplified music must be inaudible beyond the four walls of a venue. While this is a physical impossibility, it immediately put venues of all sizes in the wrong. With MIA made up of venue managers, musicians, the Musicians Union, academics and council officers and elected representatives – in the interests of full disclosure, I have sat on MIA as an interested party since its inception – exchanges were understandably full and frank. MIA has worked closely with both the University of Edinburgh based Live Music Exchange, and the Music Venues Trust. The latter is an independent body set up to protect grassroots venues in the UK from the sort of issues Edinburgh was facing. Through MVT, a proposal to change the so-called inaudibility clause to a more workable notion of ‘audible nuisance’, which put venues on an even keel with their neighbours, was eventually passed by the Edinburgh Licensing Board. To be clear, this change was not a license to crank the volume up to eleven as some of those who opposed the change seemed to suggest. It was in effect a small acknowledgement that music should not be automatically regarded as a nuisance. More significantly, perhaps, the change was what is hopefully the first step in the long-term aim of introducing something called the Agent of Change. This is a legislation whereby developers building housing close to a club or music venue would be liable for sound-proofing their new residential properties. This cuts both ways, so any music venue moving into a pre-existing residential area – an increasingly unlikely scenario in the current climate – would similarly be liable for sound-proofing. Agent of Change is already in place in Australia and some more enlightened European cities, and looks like being implemented in London. Such a legislation would need to be adopted by the Scottish Government at national level rather than at local authority level. If it had been in place fifteen years ago, Calton Road and its surrounding area might be a very different place. When the former Grampian TV studio formerly known as Calton Studios was rebranded as Studio 24, Calton Road was a dark and fairly desolate thoroughfare, enlivened only be a thriving night-life which had existed there for years. At one end of the street was the Venue, home to legendary nightclub Pure. On New Street, an old bus station provided the first home twenty-one years ago for the Bongo Club, which brought together various strands of the city’s grassroots arts scenes in a venue that also housed artists studios. Then, further along the road, under the bridge, Studio 24 became home to numerous techno and gay nights before providing a much needed home to metal-heads. 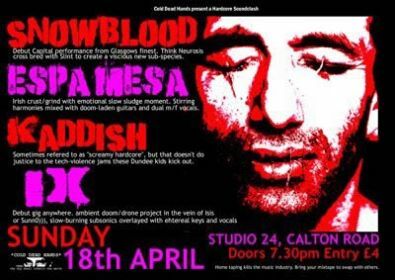 As the last survivor of that holy trinity of venues, Studio 24 has become a lifeblood of independent non-mainstream music in the face of encroaching gentrification which has transformed Calton Road and the surrounding area. Residential developments now line the once barren street. Beside the club itself is a block shared by student flats and the offices of Holyrood magazine. There is an architects office, while over the road, the sign for the old Craigwell Brewery is still visible atop the archway that now leads to more flats. These were presumably bought because the owners wanted to experience the vibe of city centre living, but who will soon be occupying a soulless dormitory, devoid of personality or life. Not far from Studio 24’s multi-coloured hippydelic facade, on the corner of Holyrood Road, is the Scottish Parliament. Moving the other way, round the corner on New Street, are the offices of City of Edinburgh Council. Studio 24 pre-dates both buildings by decades. Over the road from the City of Edinburgh Council offices is the site of New Waverley, an ongoing development which was green-lit despite huge protests from local residents. With the Bongo now decamped elsewhere, at the street’s far end is the Arches, a row of ‘artisan retail units’ situated in long neglected railway sidings. Prior to opening as assorted coffee shops, these arches had been cleaned up and transformed into a mini arts village for the first Hidden Door arts festival in 2014. For the next two years, Hidden Door took up residence in the local authority’s abandoned lighting depot before the King Stables Road site is converted into a hotel. This year’s Hidden Door is currently in full swing, having taken over Leith Theatre, which has lain shamefully unused for a quarter of a century. Over its first weekend, a packed audience watched Scottish Album of the Year winner Anna Meredith and her band perform a fusion of contemporary classical and techno before encoring with a rollicking version of (I’m Gonna Be) 500 Miles by The Proclaimers. On Monday night, five electronic composers performed a live soundtrack to Metropolis, Fritz Lang’s classic 1927 science-fiction film. In the film, a monumental city is divided, with wealthy industrialists and town planners reigning from a network of spectacular art deco high-rises. Here they are set apart from the workers, who live ‘beneath, where they belong,’ as the city’s creator Joh Frederen says to his son Freder. Here the workers operate the machinery that powers the city. Some might argue that given the amount of new housing built in Edinburgh over the last couple of years – a high proportion of which are a mix of luxury apartments and student flats – the capital is being to resemble Metropolis. If this is the case, it is without any of the artistry or ambition of the grand designs that grace Lang’s film, but with all the attempts at social apartheid in place. Also in Leith, what was once regarded as the worst pub in the city has been transformed into Leith Depot, the upstairs function room of which provides a vital small venue for local and touring acts. Leith Depot sits in a block alongside a series of other locally run businesses, who were told by the developers who recently purchased the block that they hope to demolish the existing buildings and build flats in their place. The Bongo Club, meanwhile, now in its third home in the Cowgate, looks like it may soon be nestling next to another hotel. This is despite the adjacent land being left undeveloped for forty years with the specific purpose of extending the Central Library, the entrance of which stands above it on George IV Bridge. To cap all this off, there is the ongoing saga of the former Royal High School, another neglected building which has been empty since 1968, and which hangs some way above Studio 24. Having been passed over as the home of the Scottish Parliament in favour of architect Enric Miralles’ purpose-bulit construction, developers have proposed yet another hotel. A counter proposal from St Mary’s Music School to move into the building as its new home is also on the table. Given the close proximity of all of this activity in terms of developments, one could perhaps be forgiven for suggesting that it looks suspiciously like a form of social engineering and social cleansing that is using grassroots art and culture as a short-cut to gentrification. Again this recalls Metropolis, whereby the wealthy live in isolated splendour, while the rest of us live ‘beneath’. Such a notion isn’t unusual. Contrary to what some might believe, neither is Edinburgh unique in having the life ripped out of its city centre in this way. In London, the city’s equivalent of Tin Pan Alley, and once a hub for the music industry, has been changed beyond recognition following re-development. In New York, CBGB’s, the city’s seminal cauldron of punk, closed after its owners could no longer afford to pay the rent in a once derelict neighbourhood. In Liverpool, the site of Cream, one of the UK’s first super-clubs, has been flattened to be replaced by student flats. This isn’t the first time Liverpool’s night life has fallen victim to the bulldozer. In 1973, the Cavern Club, the tiny cellar where the Beatles and a million other beat groups changed the world on a then run-down Matthew Street, was filled in and a car park built in its place. Only when the city fathers saw they could make a few bob was a new Cavern club built, allegedly with the old club’s original bricks. As the Beatles heritage industry ran on apace, at one point there was even a John Lennon wine bar which required patrons to wear a tie before being allowed in. Manchester, meanwhile, has always got their first, be it with the industrial revolution and capitalism as we know it or the seeds of communist thought. The Hacienda club, which helped transform the possibilities of what a nightclub could be and transformed 1980s youth culture, is now a residential block called Hacienda Heights. In Glasgow too, developers are hovering, with new builds and hotels rising ever higher across the city. The closure of multi-arts venue the Arches – not to be confused with Edinburgh’s artisan retail units – following the withdrawal of its late license on the recommendation of Police Scotland, has left a major hole in the city’s nightlife. Despite all this, people shouldn’t fall for the recent wave of click-bait led articles bemoaning the apparent death of Edinburgh’s live music scene compared to Glasgow. For two cities so wonderfully diverse in shape, size and demographic, as well as radically different social, political and economic histories, such comparisons are fatuous. The sort of clickbait led articles that say such things have a tendency as well to lump Edinburgh’s assorted venue closures together as a one-size fits all exercise that provokes similar waves of understandably emotional collective outrage as happened in response to Studio 24’s announcement. 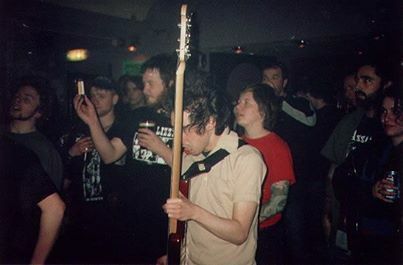 Over the years Edinburgh’s live music venues have closed for various reasons. Fire decimated the now re-opened Liquid Rooms, while the 2002 Cowgate blaze – arguably a developer’s blessing in disguise – took out La Belle Angele, which has also now re-opened. The Gilded Balloon, Gilded Saloon and Bridge Jazz Bar weren’t so lucky. The spectacular mismanagement of Edinburgh University Settlement and its subsequent liquidation saw the Roxy Art House and the Bristo Hall home to the Forest Cafe forced to close overnight. More recently, the Picture House’s conversion into a branch of Wetherspoons is well-documented, and has its roots in former owners HMV flogging off its assets due to an apparent lack of foresight in terms of investing in the digital market. Electric Circus closed due to retiral. The proposed expansion of the Fruitmarket Gallery that the club’s closure will allow looks from the outside like a successful attempt to ward off the developers and hoteliers who were almost certainly circling in the same way they have over Studio 24. Much of the misconception regarding the closure of Electric Circus came from the inaccurate way it was reported in some places. The root of this came from City of Edinburgh Council’s report on the joint proposal by Electric Circus and the Fruitmarket Gallery. The wording of the report seemed to suggest that an art gallery was somehow more valid than a club and music venue as a place of artistic expression. No one at the Fruitmarket suggested this was the case. Neither did anyone at Electric Circus. Given the historical relationship between music and visual art, particularly over the last twenty years or so in Scotland, anyone attempting to set the two in opposition to each other was seriously missing the point of how art works across all forms. This raises issues about civic ignorance regarding live music. It points as well to a need for a cultural shift, which recognises and acknowledges the co-relation between artforms as equals. This again points to what might be perceived as a social divide. Theatre, dance and visual art all receive substantial public funding, both at institutional and developmental level. In music, jazz, classical and folk are treated with similar respect, despite, and sometimes because of, their specialist appeal. Historically, what for convenience we’ll broadly call rock music, but taking in pop and club culture, has rarely if ever been invited to the public funding party. Part of this is down to rock’s original sense of outsiderdom and rebellion.. While this may seem laughably naïve now given the generations of millionaires created by the music industry, it is still considered uncool in some quarters to get involved with public funding bodies. Such bodies have been traditionally associated with the establishment, and getting involved with them might still be regarded as a sell-out. This is beginning to change, however, and the introduction of funding schemes for contemporary music are starting to appear, and indeed to appear credible to those they are aimed at. This is partly to do with a generation of bureaucrats who make the decisions having grown up steeped in music. This is certainly the case with Scotland’s arts funding body, Creative Scotland, even if for an SNP government exporting a few hand-picked acts to South By South West and other places has a political agenda as much as an aesthetic one. But public funding needs to go to venues too. Not just the civic-run concert halls, but clubs and pubs like Leith Depot and Studio 24 need to be supported, because it’s in venues like these where the future starts. With the safety net of public funding, venues can take risks with the artists they book, allowing them to develop audiences over the long term without having to worry about the constant threat of potential closure. But make no mistake, there is plenty going on musically in Edinburgh. You just have to find it is all, and it is noticeable that independent promoters and artists are starting to put on events in church halls and social clubs, the original centres of civic gatherings. Edinburgh has always been a Jekyll and Hyde city, and while its glossy facade of national art institutions and international festivals remain vital, it is down the back-streets and in the cellar bars and clubs where the future state of art is being carved out. But for that to continue, those back-street cellar bars need protecting, and Agent of Change is the first port of call for that. It is not yet known what the new owners of Studio 24 have planned for the building. It seems inevitable, however, that they will seek planning permission for residential developments of some kind. Permission will have to be applied for through City of Edinburgh Council’s planning department. Given the response to Studio 24’s closure, there may be objections to such a proposal, though any energy currently being focused in various petitions aimed at bodies who have no control over any of this might be better served lobbying the Scottish Government to adopt the Agent of Change. In the meantime, anyone walking along a dead-looking Calton Road this week with the amplified voice of the Waverley Station tannoy ringing in their ears might wish to pause a moment outside what for now at least is still Studio 24. It is here the writing is on the wall in a far more creative way than simply signalling the end of an era. This comes from some of the words that adorn the wall’s multi-coloured mural in a way that is an extension of the activity beyond. These are the names which, for those who weren’t there, seem like incongruous slabs of concrete poetry. Those who were there, however, will recognise these words as the names of some of the city’s most crucial club nights, and which have become the stuff of legend. There are other, even older names up there too. ‘McGoo’s’. ‘Annabel’s’. ‘Astoria’. Immortalised like this as the ghosts of club nights past, those words provide a potted social map of Edinburgh nightlife over the last fifty years. In this way, Studio 24 and other venues like it are pieces of living history. By rights, they should have preservation orders slapped on them like the rest of the city’s cultural assets. They should be given public funding and, instead of having to fight for the right to party, be allowed its voice, as loud and as proud as it likes. No-one wants to preserve Edinburgh in aspic, and indeed there are some signs of optimism. A new concert hall has been mooted, while the new owner of St Stephen’s Church in Stockbridge, who is also about to open the new Rose Theatre in an old chapel on Rose Street, wants to make it a major centre for dance. These are admirable ventures and should hopefully be inclusive enough to accommodate all artforms, including rock, pop and club culture. But what about the City of Edinburgh Council signs on Rose Street, a stone’s throw from the church that houses the new Rose Theatre, that outlaws busking? And what about young dancers like Jack Webb, who may end up performing in St Stephen’s, but might also want to go and dance to Into the Garden by Artery at Betamax on a Saturday night in somewhere like Studio 24? Will he and others like him find an outlet for their talent in a place that allows it full vent? Or will they simply learn to live quietly indoors, in a capital city where they’ll always be ‘beneath’. Studio 24 will close on June 24th. Details of events can be found on the club’s Facebook page. I remember that club as Stewart Abbey Mount, I learned to dance there, that was in the Fifties, on entering on a Saturday night you were politely asked if you could dance, if you answered Yes then you used the top floor if you said no then you were ushered down stairs, there you were taught to dance by the hostess and were not allowed upstairs until they knew you could dance. Ofcourse this took a few weeks until you were proficient. I have very fond memories of Stewarts, ah but those were the days. What a lovely memory. Thanks for sharing it. I remember Mingin’ and Pillbox during the short spell that I lived in Edinburgh. Happy days. Sad that the venue is closing for good, but glad that it kept going for so long – I remember hearing rumours back then that the place was under threat. Mingin’ and Pillbox were two of my favourite nights, back in the day. It’s a shame that the venue is finally having to close, but I will always have my memories (or lack thereof)!